Want some help with weaving the background? Here it is! The background of our block is created by weaving together two fabrics. Before cutting, you will need to add Soft Fuse to the back of both pieces of fabric. Cut the gray fabric into 2” strips. of the strips slightly as you go from top to bottom). Leave 1” at the top uncut. 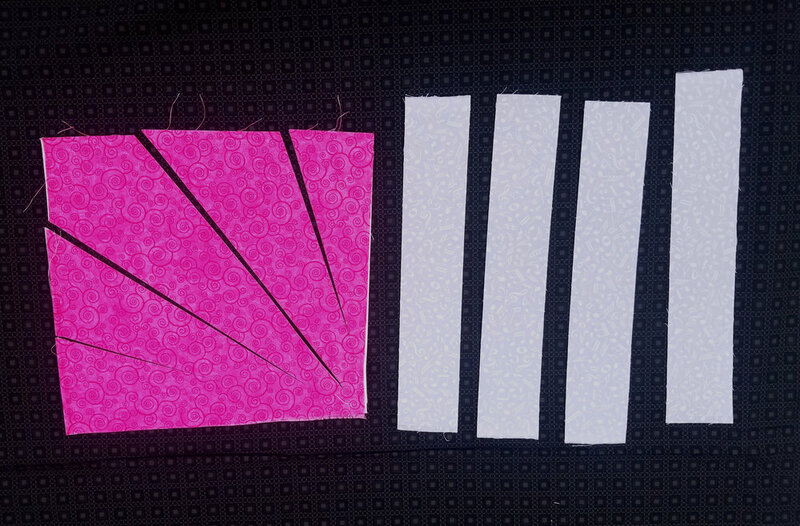 Start at the right hand corner and cut the pink fabric on an angle into 2”- 2½” slices. (Note: you will add perspective by adding width to the strips as you go from top to bottom). Annie's Quilting Den Block (a.k.a. row) for 2018. Before starting, remove paper from the back of the pink fabric. Then remove the paper backing from each gray strip as you go. Weave the first gray slice, over and under the pink pieces. Continue weaving until all gray slices are used. Once the weaving is done, tighten up the weaving and then fuse the block onto parchment paper or an appliqué pressing sheet. Sew the background edges using a zigzag or decorative stitch to join the pink and grey fabric. Square it up to 18-1/2” x 18-1/2”.